Don’t Forget To Promote Your Good Work– We are so busy as leaders running our organizations that we forget to promote our efforts. While we usually say our work will speak for itself. It is still vitally important to Toot Your Own Horn! I had the pleasure to interview Jilea Hemmings. Jilea is the Founder & CEO of Leaf Tyme and Best Tyme. Jilea is a staunch believer in the power of entrepreneurship. A successful career revamping Fortune 500 companies was not enough for her entrepreneurial spirit, so Jilea began focusing her passion into her own projects — beginning with the formation of her own consulting agency, Eshe Consulting, and the development of the innovative meatless entrée line for kids, Greenie Tots. 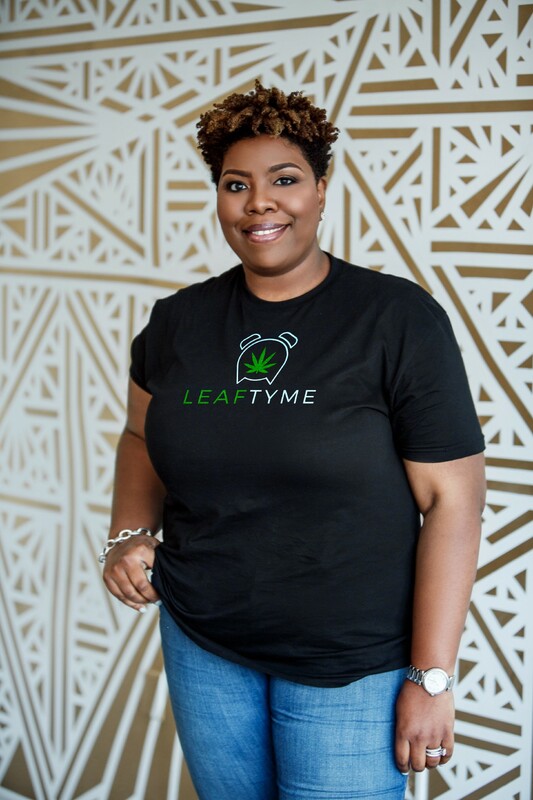 Her passion for entrepreneurship and technology continues to flourish with the development of Leaf Tyme, a e-commerce platform that connects customers to licensed dispensaries, brands and resources, provides information on the cannabis laws in every state, and educates on how cannabis can help with common health conditions. I became interested in cannabis when my cousin was diagnosed with an inoperable brain tumor in 2013 and was told by his doctor that he wouldn’t make it to his sons high school graduation that same year. My cousin is like a brother to me and I was determined to find an alternative for him, other than traditional medicine. I watched the Dr. Sanjay Gupta special on Cannabis and I wondered to myself, if this plant could really help my cousin. I didn’t know how to access the medicine or who to trust. I scoured google, looking for information. I was lucky to find a few referrals that included an educational trip to California to get my cousin access to the medicine that he needed. Making that trip to California changed my life and I’m happy to say that it also changed my cousin’s life as well. He was able to gain access to the plant in oil form and not only did he attend his son’s high school graduation, but he also attended his college graduation. My cousin is alive and well because of cannabis oil and this amazing Cannabis plant. After my experience, I wanted to make sure that people around the world could also gain access to trusted information and resources about cannabis. This is why I created Leaf Tyme. The cannabis industry can be a very lucrative business, but if you don’t know how to maneuver or who to trust, it is easy to become frustrated. When creating a business, social media is one of the most efficient vehicles used to build brand awareness. Payment gateways have made collecting payments from customers seamless. This all rings true to most, as long as you are not in the Cannabis business. Medicinal cannabis is currently legal in 33 states and recreational cannabis is legal in 10 states plus Washington, D.C. . (since this article has been published). With all this advancement, it is important to note that cannabis is still illegal on a federal level. For this, the banking industry and social media platforms have made it very complicated for growing businesses to flourish. Certain social media platforms will not allow you to promote cannabis related products. Social media platforms will allow cannabis companies to create a profile, but that’s where it ends. Also, the banking industry has made it difficult for cannabis related companies to collect money using certain payment gateways. We have been deactivated from several payment gateways and we don’t even touch the cannabis plant. There are a few domestic companies that will allow you to use thier payment gateways, but sometimes they will charge you higher fees and ask for a deposit. Cannabis related companies automatically are listed as high-risk companies and are subject to more scrutiny. These are hard lessons to learn in the cannabis industry and if you don’t have a mentor or just someone you can trust to guide you. It can be a very difficult and frustrating road. Can you share a story about a mistake you made when you were first starting? Can you tell us what lesson you learned from that? When you’re building any business,there will be plenty of mistakes that will be made along the way. Especially when entering into a new industry that is growing tremendously, but still illegal on a federal level. So there will be challenges that you will face that you never really expected. When my husband (Co-Founder of Leaf Tyme) and I created Leaf Tyme, we decided that we wanted to create an awesome and stylish logo to represent the brand. We came up with an idea to take the logo from our health care app Best Tyme, which looks similar to a clock and make one simple change. We put a cannabis leaf in the middle of the clock, which matched perfectly to our name Leaf Tyme. We were so excited about new logo and created all our company branding to match including a website,merchandise, and literature. It was time for us to obtain a payment gateway for our platform and we kept getting denied. I asked the agent why we were getting denied for payment gateway we applied for. He said the first thing payment gateways notice is our logo which includes the cannabis leaf. We explained that we do not touch the plant and provided ancillary support to the cannabis industry. Bottom line, he said, it did not matter. Many payment gateway companies will not touch anything cannabis related. It was a shock to us that a simple logo would scare them away. Understanding the impact of the plant being federally illegal is so important, as these are common issues that cannabis related companies come across. Leaf Tyme’s sole focus is to be a trusted resource and e-commerce platform for the cannabis industry. What makes our company stand out from other companies, comes down to integrity and trust. Some companies may provide access to dispensary directories, but their information is not always correct. Other cannabis directories may include unlicensed dispensaries on their platform. Our platform will only list dispensaries that are licensed and we check state databases to insure authenticity. Our purpose is to guide new consumers and patients to a dispensary that is licensed by their state. Leaf Tyme also provides a home for ancillary brands in the cannabis industry that don’t directly touch the plant. Which includes lawyers, wellness coaches, chefs and accountants to name a few. Our platform is a e-commerce platform for hemp derived CBD products as well. Hemp derived CBD is now federally legal throughout the United States, thanks to the 2018 Farm Bill that was passed last year. Leaf Tyme provides a home for these business and give these companies another avenue to promote and sell their products to a wider audience. I am excited about our Best Of The Best In Cannabis Series. We are highlighting awesome people in the cannabis industry, who are doing the work to provide innovation and driving social change within the cannabis industry. We also creating an award show, that will be the Oscars for the cannabis industry. The most important thing you can give your teams is the ability to have an open platform to express their likes, dislikes, and suggestions. Not one, but many. First my family who provides unconditional support for my entrepreneurial efforts. Secondly my cousin, who trusted me with finding medicine to cure his inoperable tumor. Felicia who so graciously ushered me into the space of cannabis and helped provide education on the plant. Alexandra who believed in my vision for Leaf Tyme without hesitation and provided initial funding to get us started. All of the social change leaders who have been fighting on the front lines to allow my business to even be possible by sparking the legislation to pass. From the moment we started our company, we have be involved in bringing awareness to the importance of striving for social equity and incorporating this pillar into our business practices and goals. If we can do it as a startup, so can those larger companies with more reach and resources. We all should be using our company platforms to move this mission forward. Here are my 5 top leadership lessons I’ve learned. Surround yourself with a board of Mentors- You need to connect to people who are operating in the space you are in. They can provide invaluable insight on how you run your organization and save you tons of money in mistakes that could be avoided. Believe In Your Vision– Your vision is just what it says. Your Vision. Everyone will not understand you idea or stance in the beginning. That is okay. This vision/mission was given to you to execute. They will see it once you create it! Listen To Your Team– Hopefully you hired your team because of their vision and skill. Don’t waste their insight. They are using closer to specific aspects of your company more than you. Give them a chance to shine. Take Time For Respite– When leading an organization, we put our people and company first. While enjoyable this is an exhausting task. Take time to rest to ensure you are operating at your best. Cannabis is saving lives everyday for people who were given a death sentence by traditional medicine. I would love to start a campaign for people who have been able to save their life with cannabis when traditional medicine had no more options. Oprah Winfrey — She is a huge influencer of my time and is the first black woman billionaire. Damon Dash — He is raw and authentic in his views on entrepreneurship and how to achieve success. I love his views on being a Boss.